Brews 67.2 to 120 (8 oz.) cups of perfect coffee per hour. Brews 62.4 to 102.4 (8 oz.) 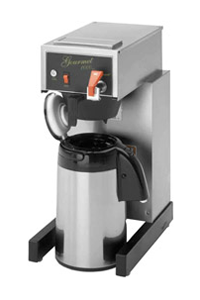 cups, (3.9 to 6.4 gallons) or (14.8 to 24.2 litres) of perfect coffee per hour. SmartWAVE® technology increases turbulence in the brew funnel. 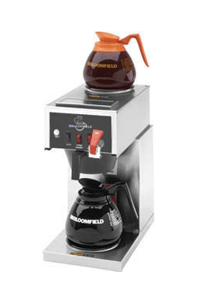 Brew into 1.9L thermal carafe using the slide-out booster tray. 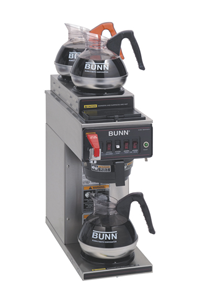 Adjustable legs to accommodate up to 3.0L (Recommended batch size: 2.5L or less) lever action and 2.5L push button BUNN airpots and thermal servers. Four-digit LED read-out for simple programming. BrewMETER® and pulse brew routines to adjust flavor profile. A high level of commonality of parts withother Bloomfield brewers will significantly reduce the inventory of spare parts required to service many body styles. 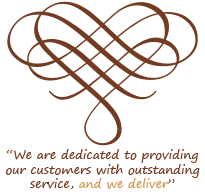 Exclusive design provides easy access to components for quick, efficient service. 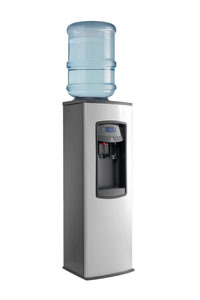 Water volume adjustments can be made with ease; no tools required and no panels to remove. Ready-to Brew light indicated the proper water temperature to help eliminate guesswork in brewing. 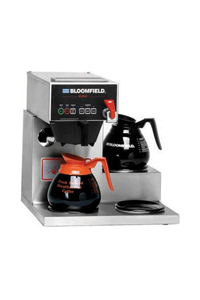 Built-in pour over feature provides flexibility of installation. By simply making an adjustment on these brewers, the unit can be raised or lowered to accommodate your favorite Newco server. Great for airpots and thermal servers. Ready light indicator ensures proper brewing temperature. Hot water faucet for tea, soups, and hot cocoa. 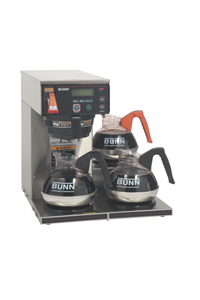 Pourover feature on all models. After Hours Mode will automatically reduce water temperature when not in use, saving energy and increasing component life. 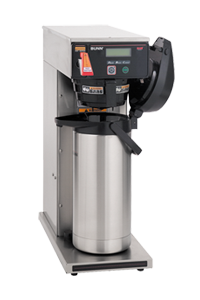 Precise brewing temperature is established and maintained throughout the brew cycle, providing cold brew lockout and ensuring full flavored coffee and faster brewer recovery. Countdown Quality Timer™ will signal the end of preset coffee holding time. 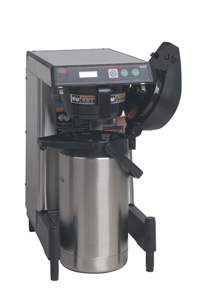 Brew cycle timer eliminates the risk of double brewing during brew cycle. Exclusive design provides easy access to components for quick service and cleaning. Temperature light indicator ensures proper brewing temperature. Exclusive design provides easy access to components for quick service. Premium quality thermostat has a full-length sensing bulb that recognizes water temperature accurately and cycles less frequently. 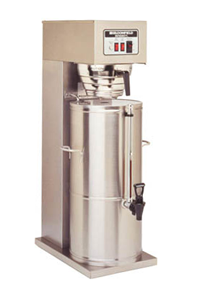 Superior sprayhead design spreads water over the tea leaves, creating agitation and a floating action that completely saturates the tea leaves to capture the full, rich essence. 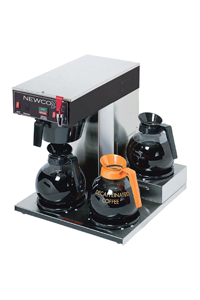 Newco's new combination NKT3-NS4 brewer incorporates a drop down tray for brewing coffee into airpots. 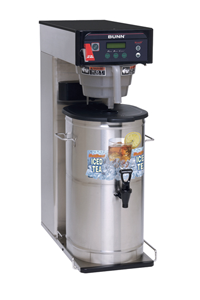 One of the few tea brewers that has a back-up pour-in feature, the NKT series delivers perfectly brewed tea every time. 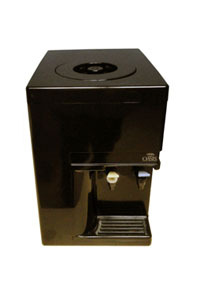 The family of NKT tea brewers are designed to accommodate a wide variety of tea dispensers on the market. 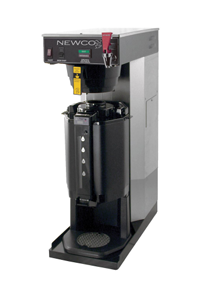 Ready light, visa-brew, auto arm and PDS valve are all standard features in the series. 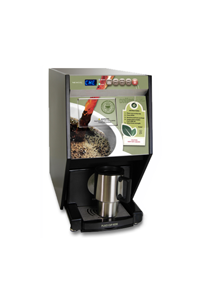 Automatically disposes of spent pods after each brew. Removable pod bin holds up to 25 spent pods. Push and hold hot water button provides up to 10 ounces of hot water for cappuccino, cocoa and soups. 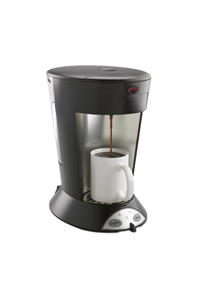 Brew 4 to 12 ounces of coffee or tea to preferred strength by adjusting the portion/volume control. Removable water reservoir and easy-slide lid to pour in water. A drawer-style pod holder keeps hands clean and dry at all times. Includes two pod holders to prevent flavor transfer. 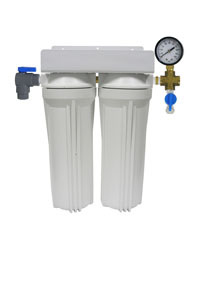 Automatic model is connected to waterline, eliminating the need to manually refill reservoir. 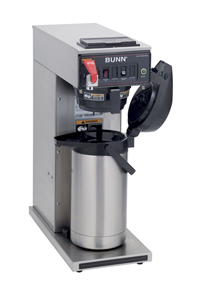 Fresh Cup was designed with the roaster/operator in mind. High quality, rugged construction that can withstand the rigors of everyday use. 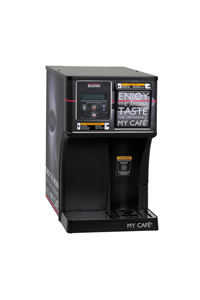 Your coffee profiles are easily programmable and provide complete control over the critical brewing parameters. 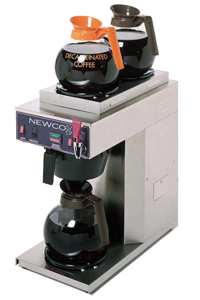 Easy access spent POD and drip tray with automatic POD counter reset. Available in Cook ‘N Cold™ or Hot ‘N Cold™. Available with white or black cabinetry. Easily converts to Point-of-Use Cooler. 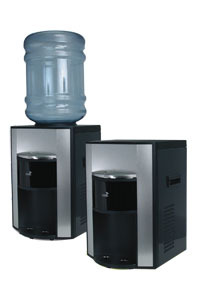 Available with stainless steel panels & black front face panel. Appliance grade stainless steel front panel. Energy Saver Model uses up to 65% less energy than other units. Hot Booster heats water to optimal temperature for tea. Push Back Faucets for one handed filling. Stylish, contemporary, and sturdy design. 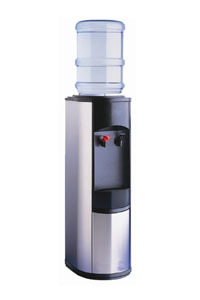 One gallon capacity stainless steel reservoir. ABS plastic front panel and top with metal side panels. Available in Hot ‘N Cold™. Integrated electronic buttons with safety release. 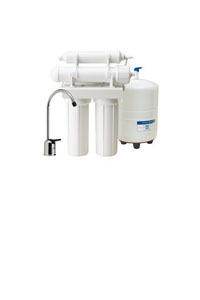 Reverse Osmosis is the optimal way to rid water of impurities. Includes an automatic shut-off valve, which shuts off the system when the tank is full, thus saving the unit from wasting water. Capable of producing 50 gallons of water per day. 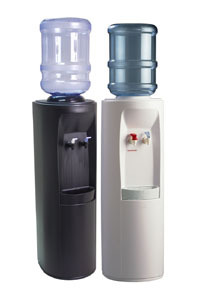 Bottled water quality from your existing water line. Unit is compact and generally fits under the sink. New and improved Micro-Pure®II filtration media, treated with bacteriostat to effectively reduce bacteria on the filter media. Exclusively precoat filtration provides chlorine taste and odor, cyst, and particulate reduction. 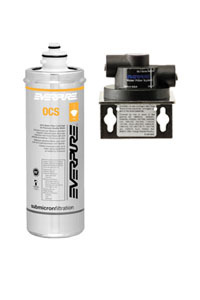 Inhibits limescale build-up in water using equipment tested by everpure. 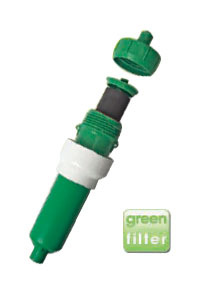 The GREEN FILTER™ features a completely re-usable housing. 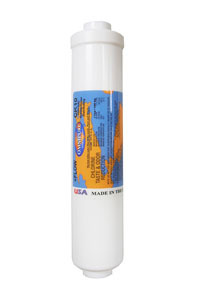 Available in a variety of different filtering cartridge elements to resolve most any water problem. Conveniently mounted in the rear of the unit for easy access and changeout. 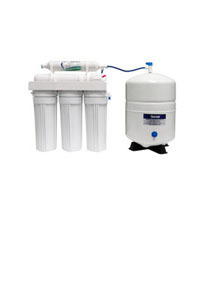 Include 5 micron sediment filter and a 1 micron carbon filter. This is an excellent choice for lime/scale, taste, odor, chlorine and particulate reduction. Service life of 3,000 gallons or 6 months. Also, available in single and triple cartridges. Taste, Odor, and Chlorine reduction. 10 micron degree of filtration. Avilable in 6, 10, and 12 inch sizes. Service life of 1,500 gallons or 1 year. Stainless steel body is great for everyday use. 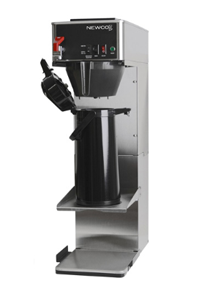 Double barrel brew through stem ensures proper mixing of coffee during brewing. 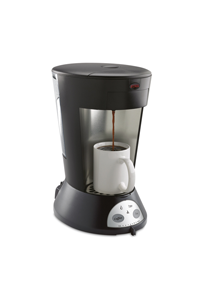 Insulated glass bladder keeps coffee hot all day without re-applying heat. Available in both metal and plastic designs. Decaf Nose Cone for identifying decaf coffee. 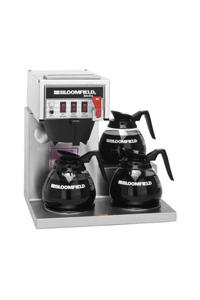 Available in both Lever and Push button interchangeable tops. 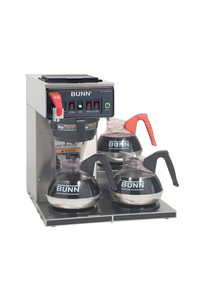 Sight guage allows for users to see exactly how much coffee is left in the carafe. Swirl design provides upscale image while hiding finger prints and dents.